Main Informations: What is Therukoothu? Therukoothu is a folk art originated from the Tamil Nadu, South India. It is a dance form or performance in Tamil language. But it is literally means Street Play. Therukoothu is performed only by men, but sometimes women also. 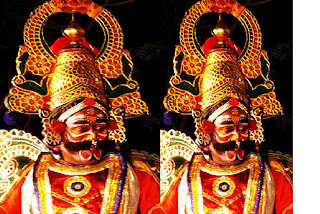 It is a traditional street play in Tamil Nadu. It is performed in the open air. It is more popular in the northern Tamil Nadu State. It has no formal dance structure. Commonly it also performed village squares or street. It is organised in summer months of year in Tamil Nadu. The performing art describes the history of religion and culture. It has the actor donning elaborate costumes and attractive make-up of characters. The performances of Therukoothu generally depict scenes from South Indian epics especially Tamil. Some times from Mahabharatha or Ramayana. Parts Therukoothu is singing and mime, and sometimes dialogues. There are different types of Therukoothu. That is Pei Koothu, Kuravai Koothu, Samaya Koothu, Nattu Koothu, Porkaala Koothu, Valli Koorhu and Thunangai Koothu. The main difference lies in the topics and culture. The instruments for Therukoothu, used are the cymbals, Mukhaveena, Harmoniam and Mridhangam.